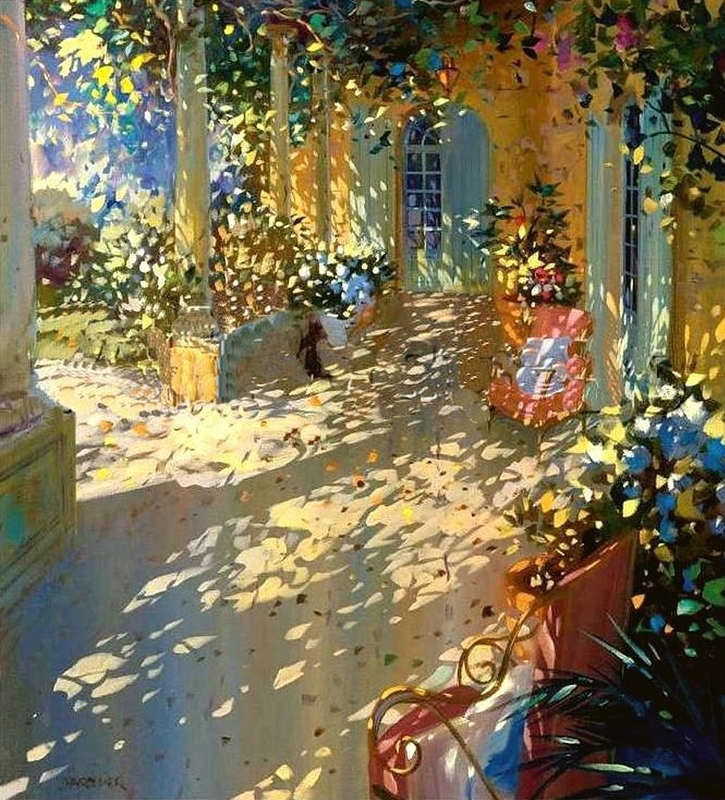 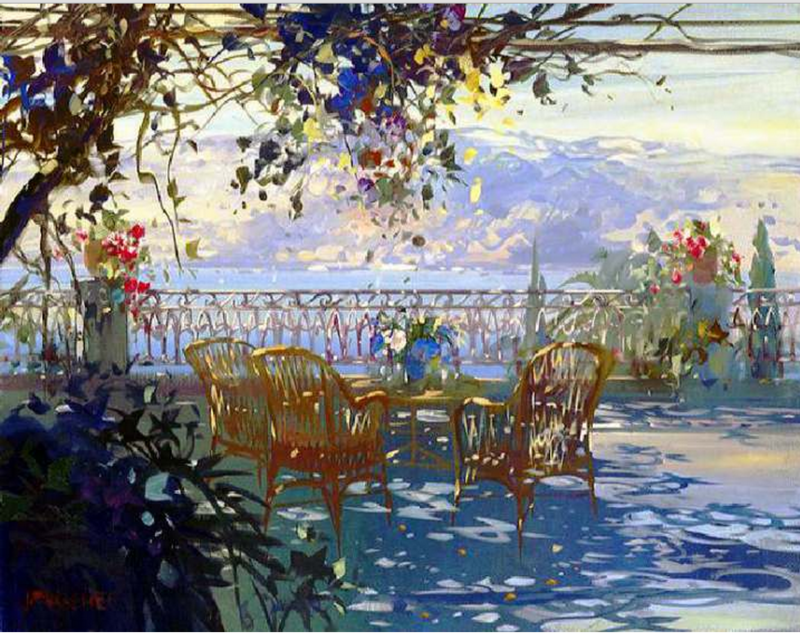 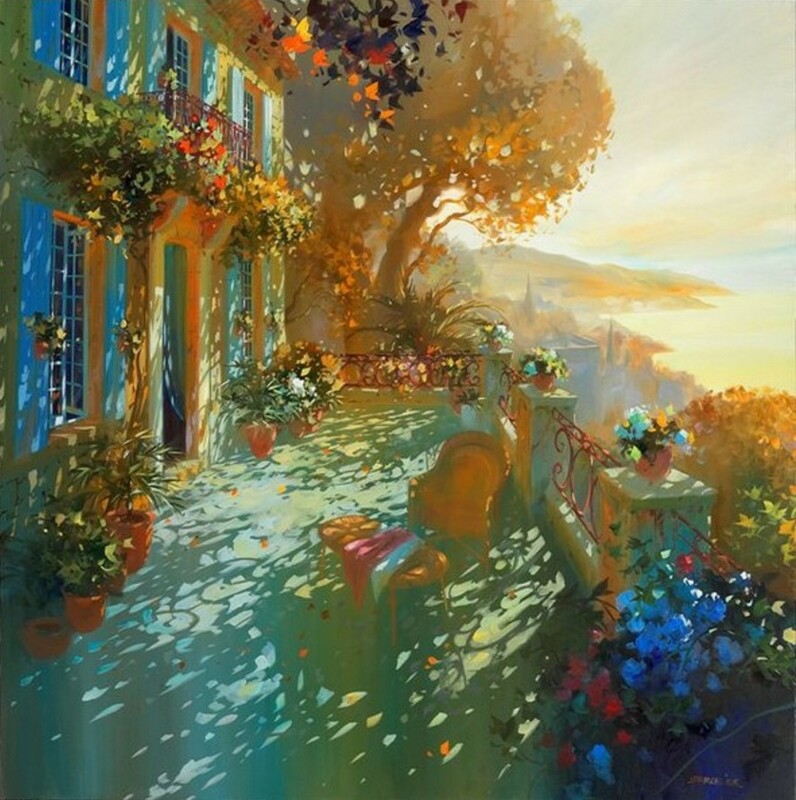 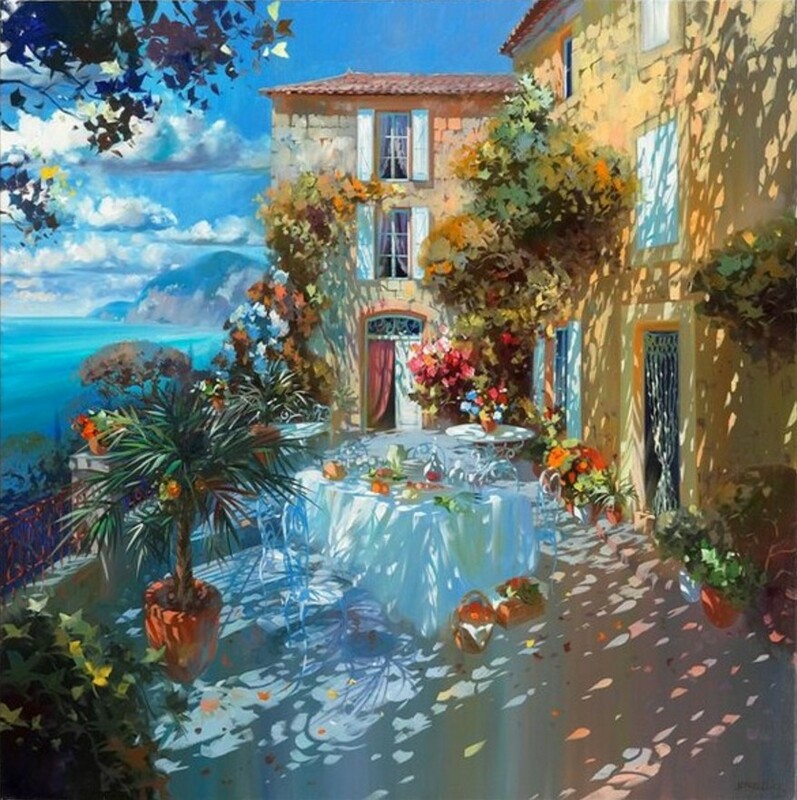 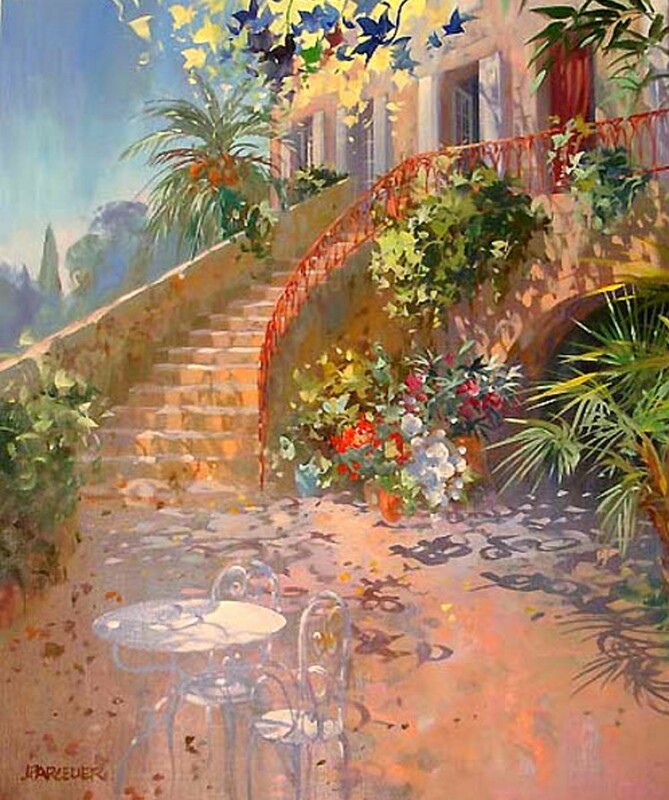 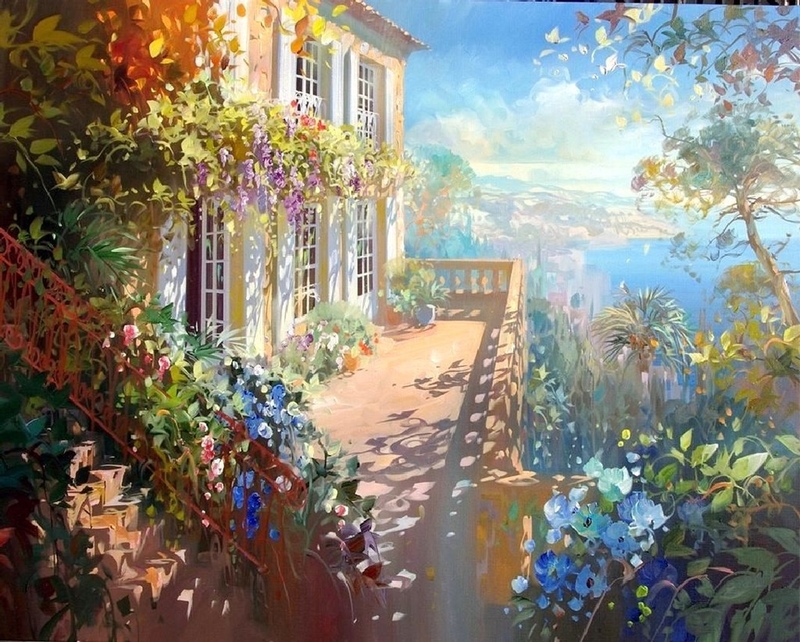 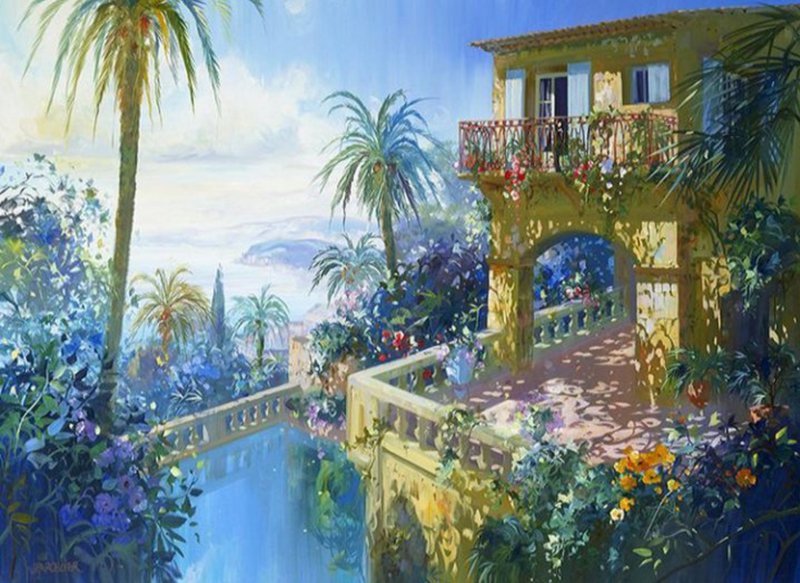 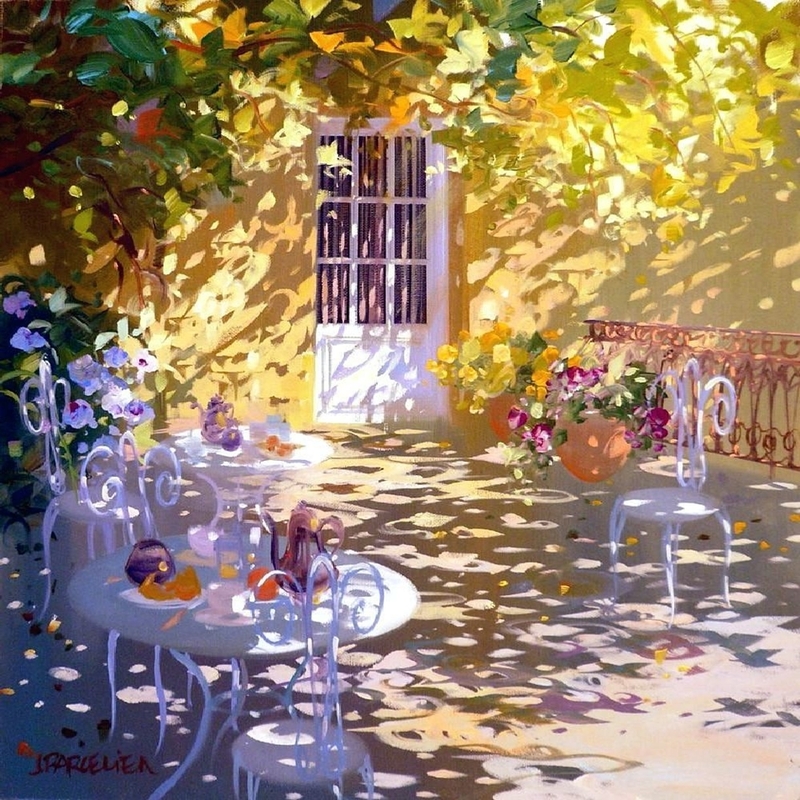 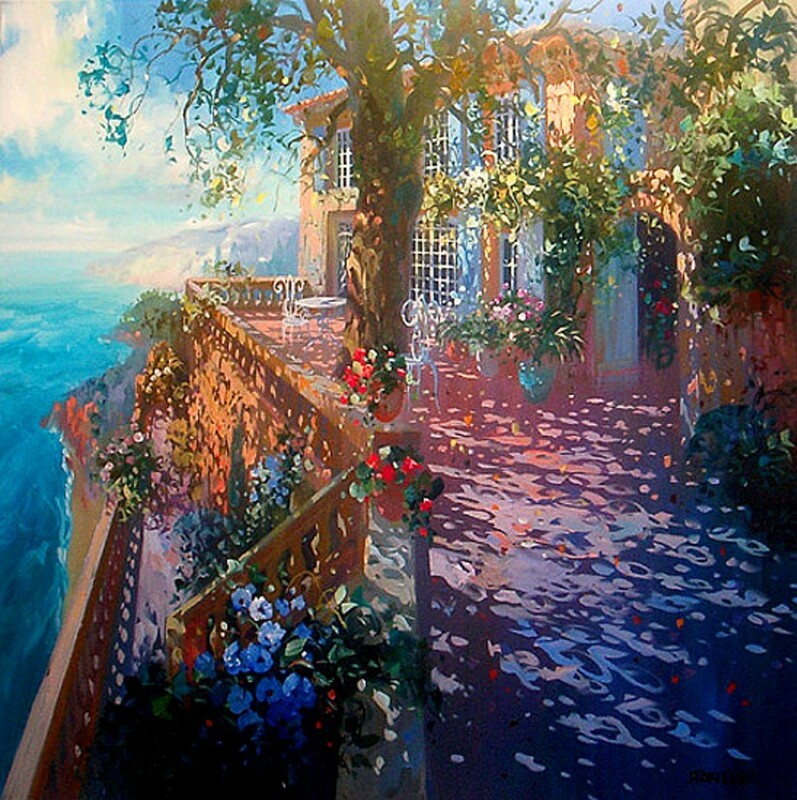 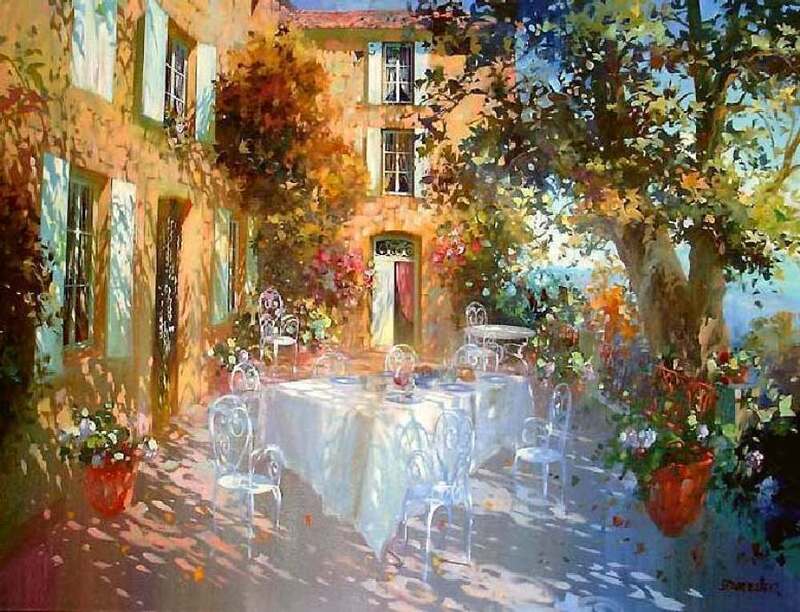 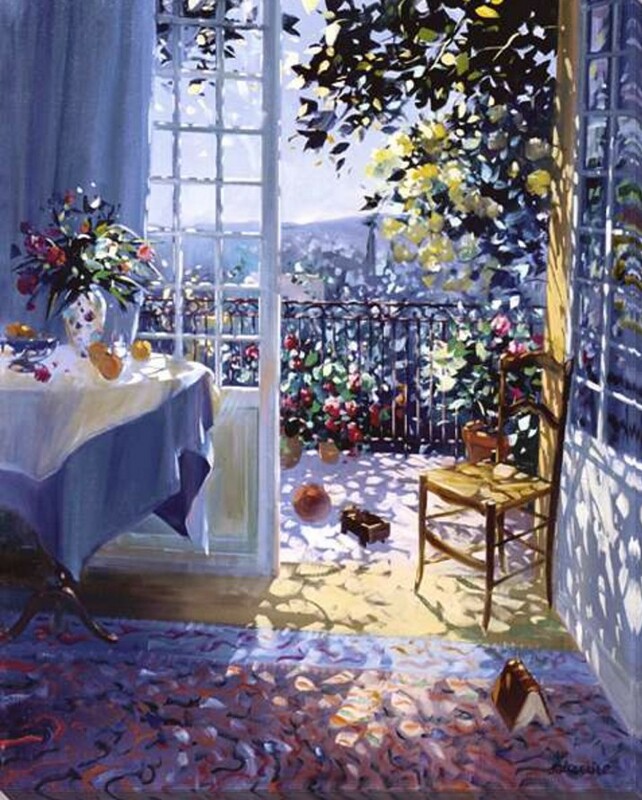 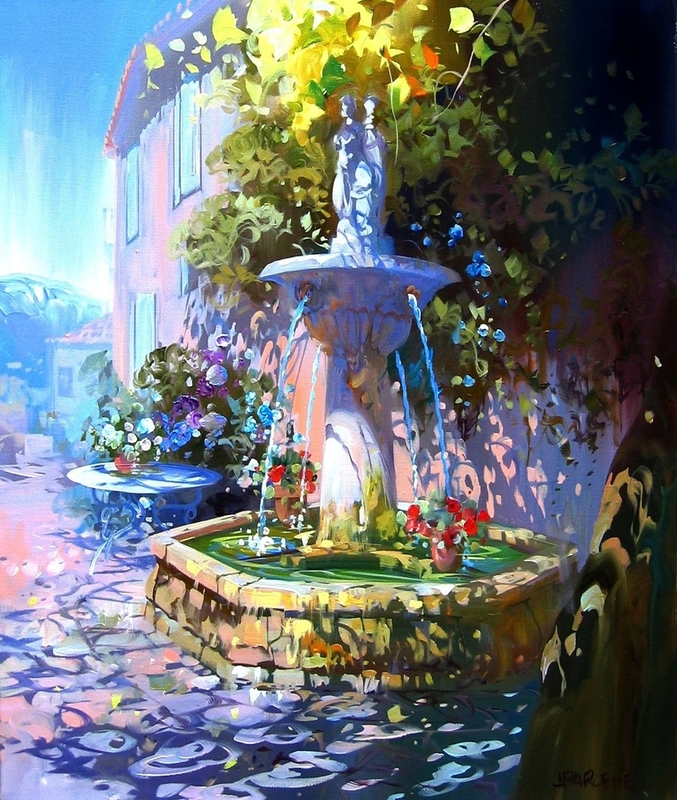 Laurent Parcelier was born in 1962 in France. 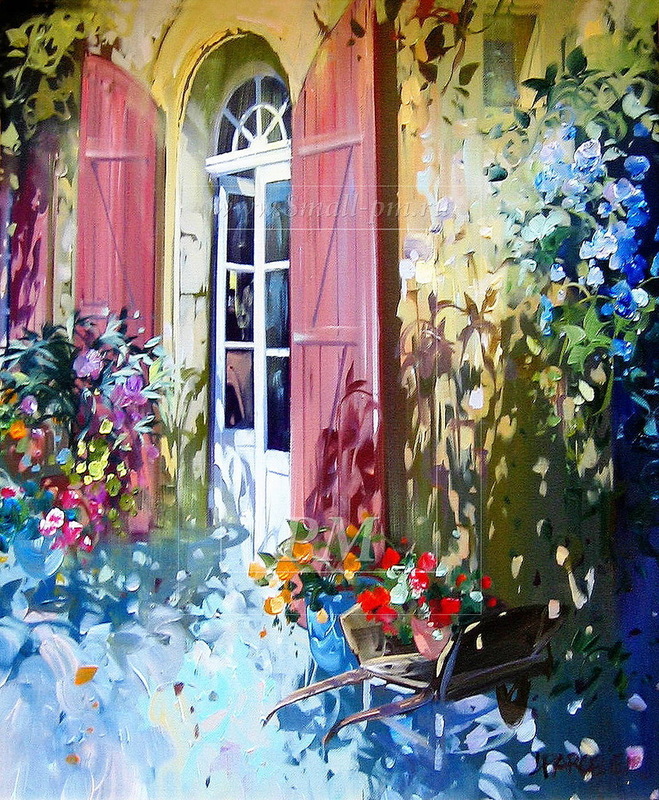 Interested in art from an early age, Parcelier attended the Applied Arts School in Dordogne. 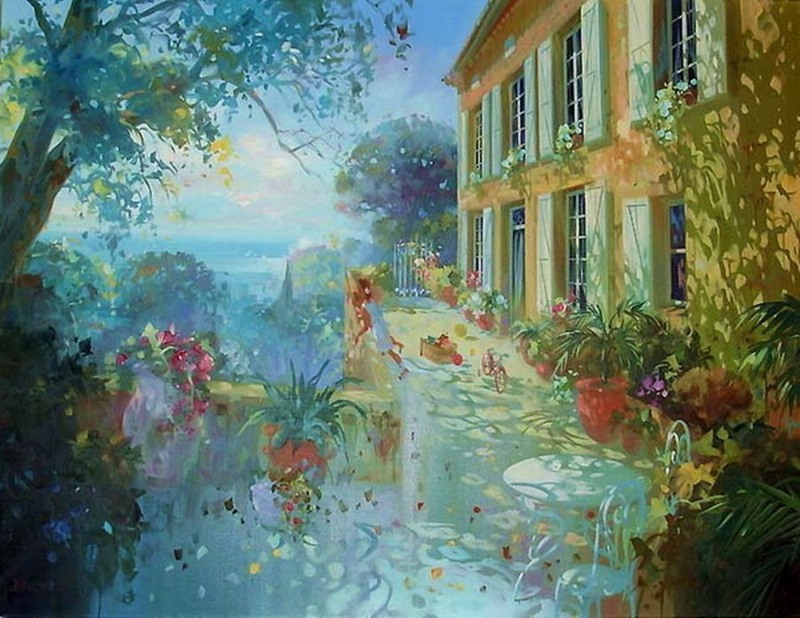 His obvious talent soon materialized into the publication of several of his albums called “Le Drole de monde” (“Strange World”). 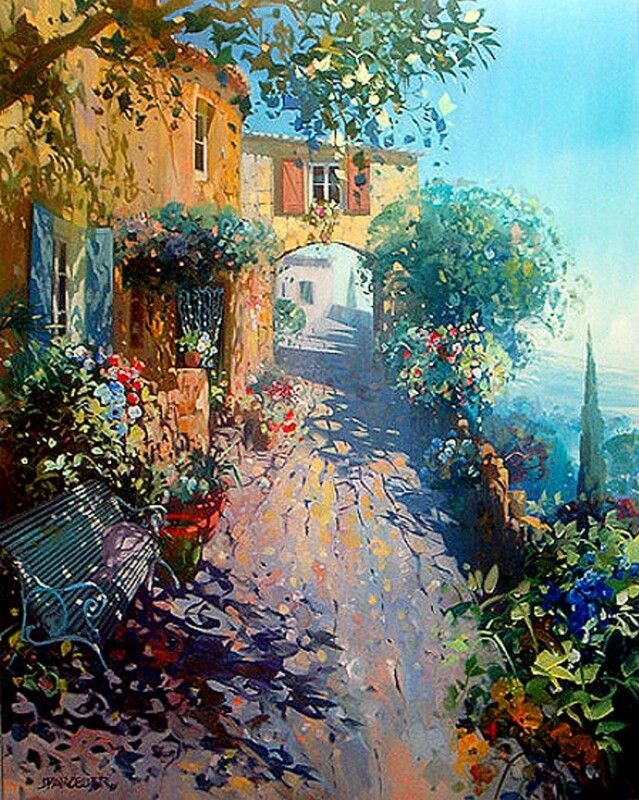 His fame was beginning to spread and his way seemed all but traced out until the paining contest on the street where he was lent a canvas, paint and brushes. 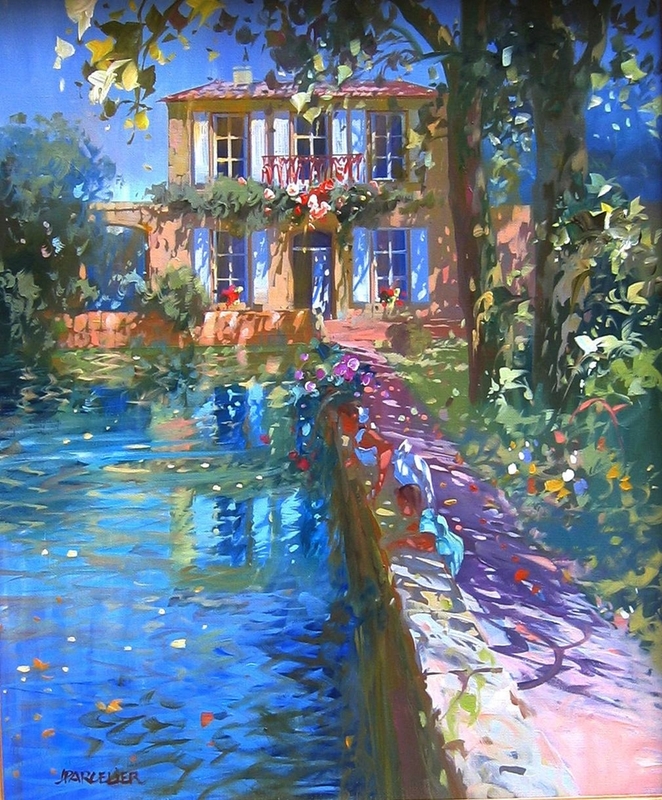 Surprisingly, although at this point Parcelier has not touched a paint brush in several years, he won the first prize. 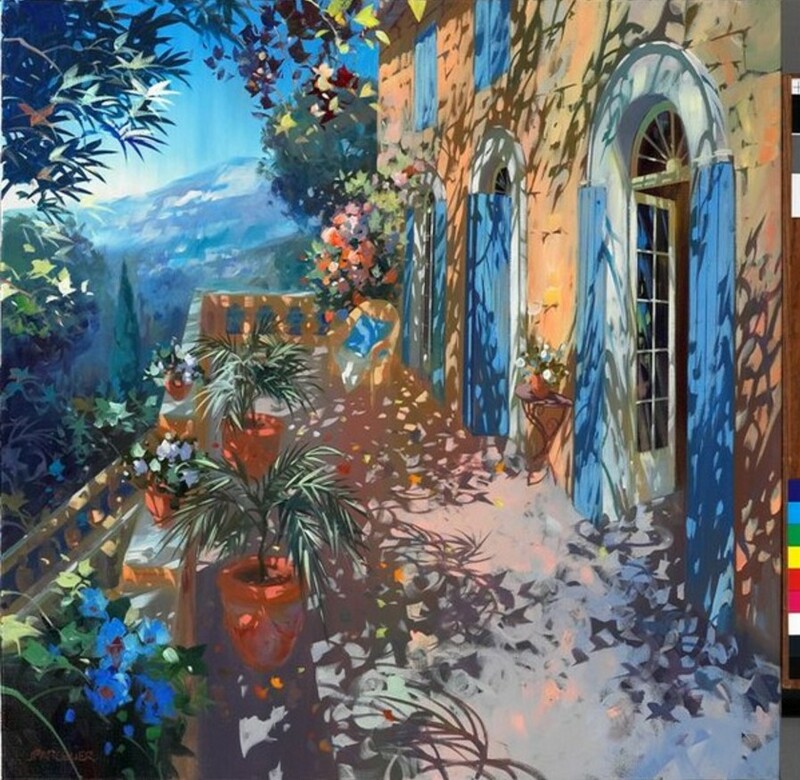 Admirers praised his for his effortless and instinctive style. From that moment, he decided to dedicate his life to painting. 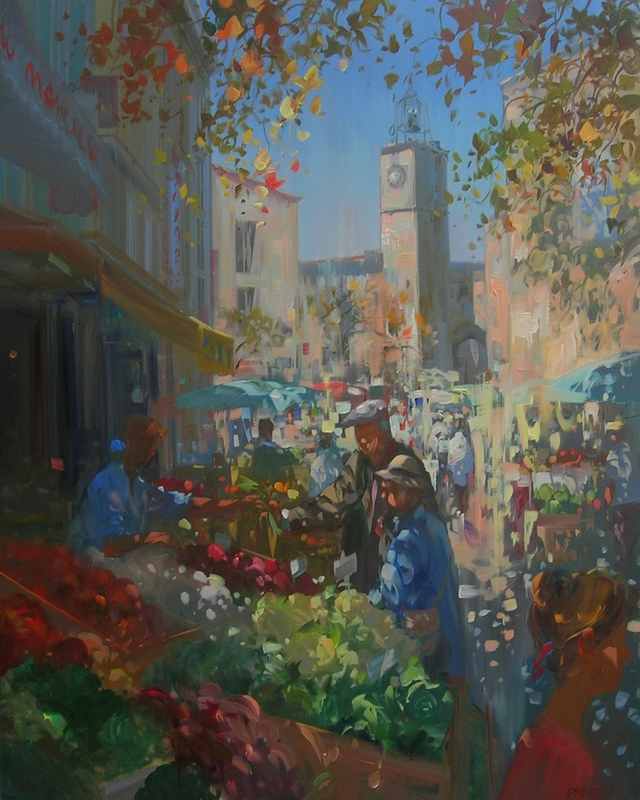 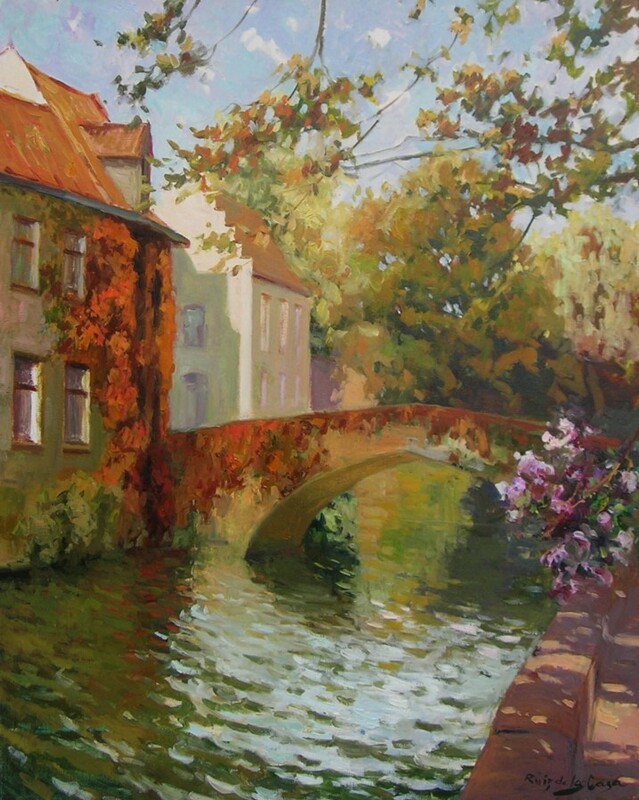 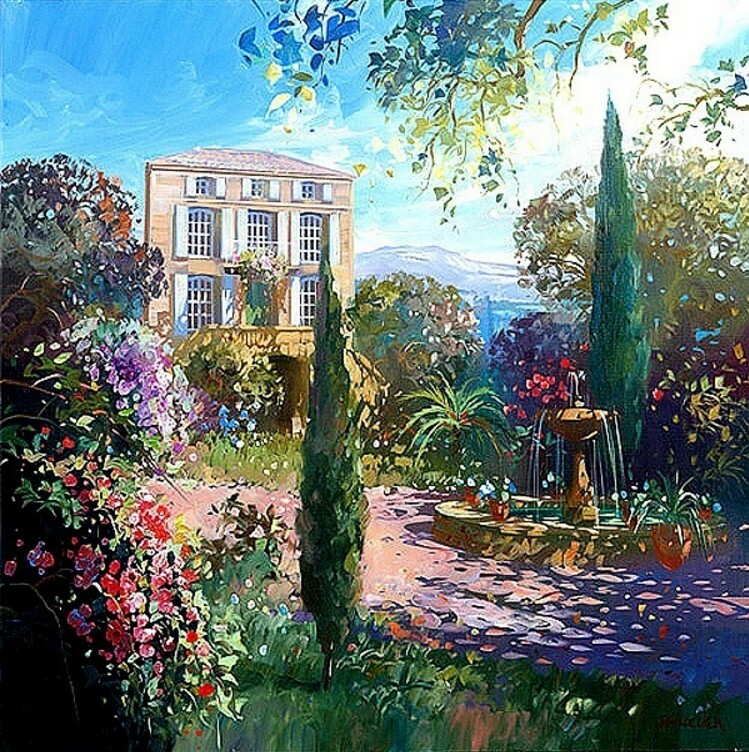 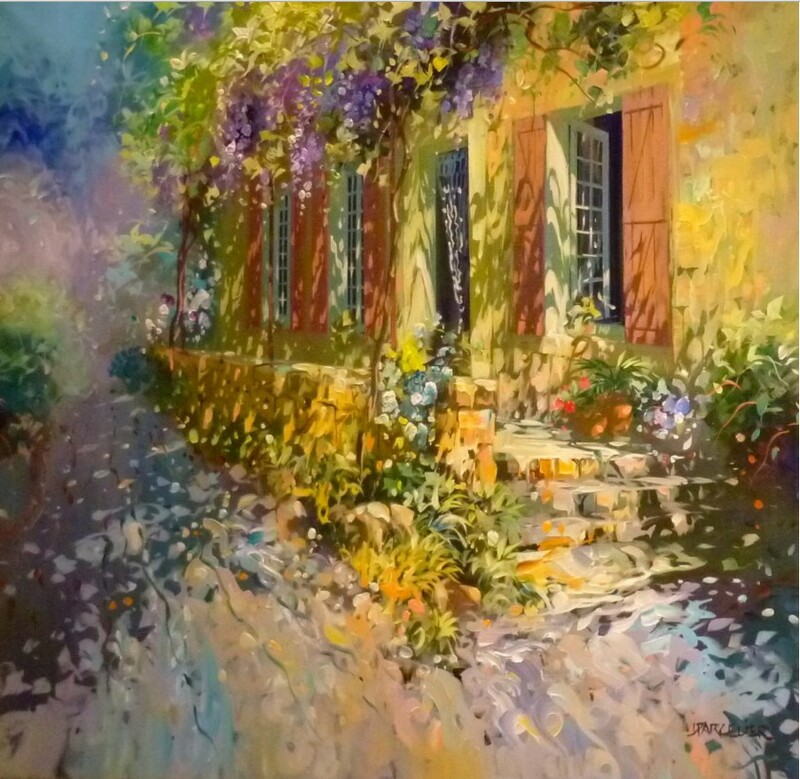 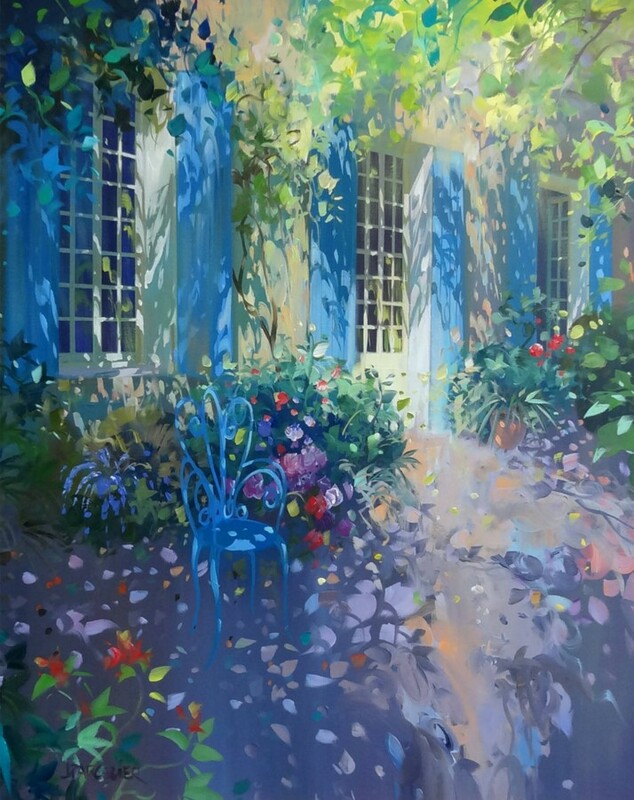 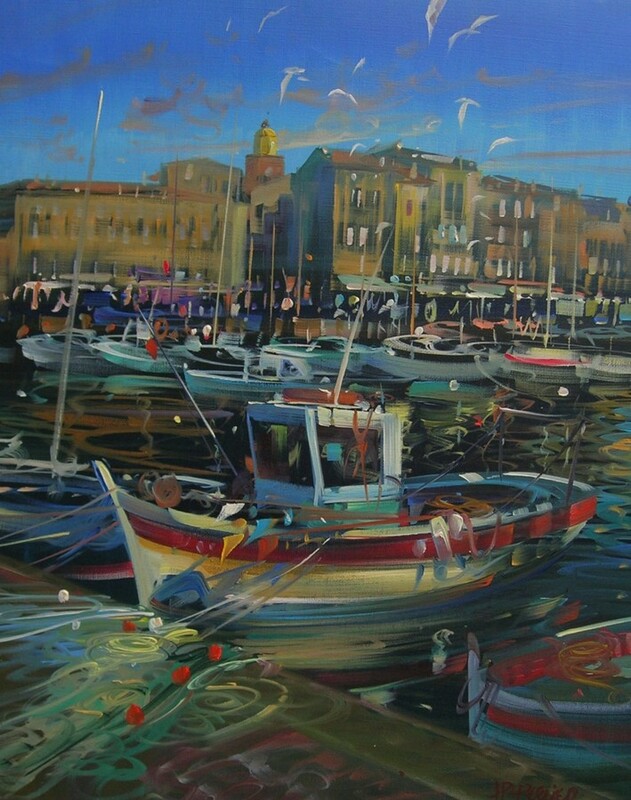 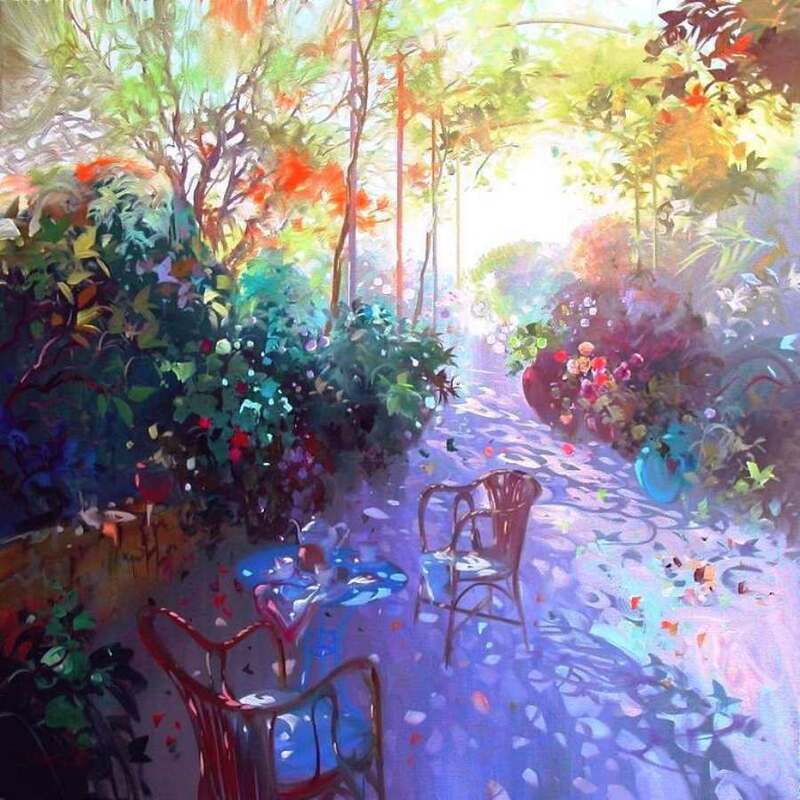 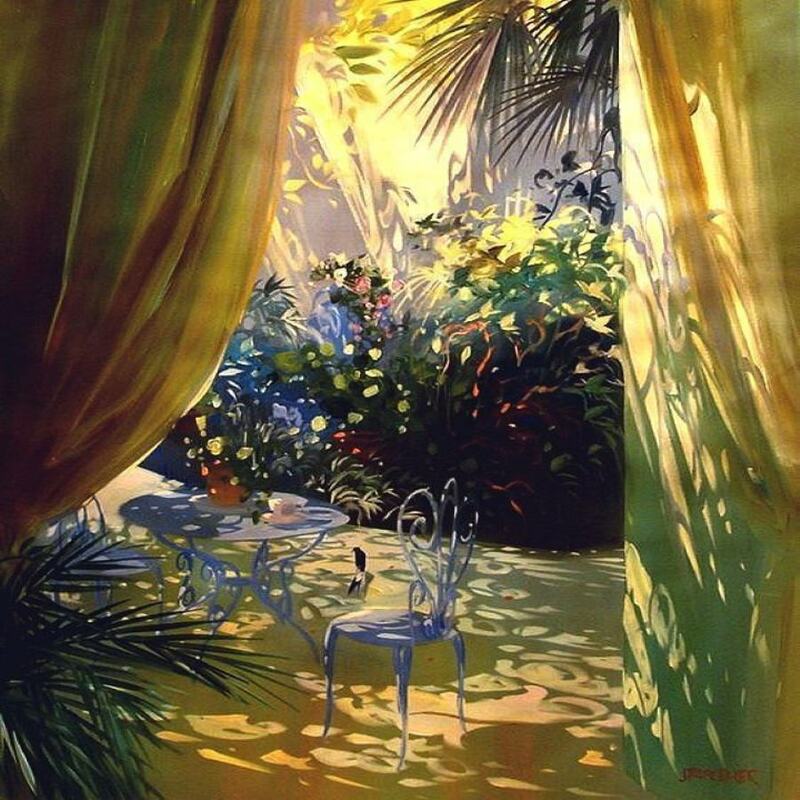 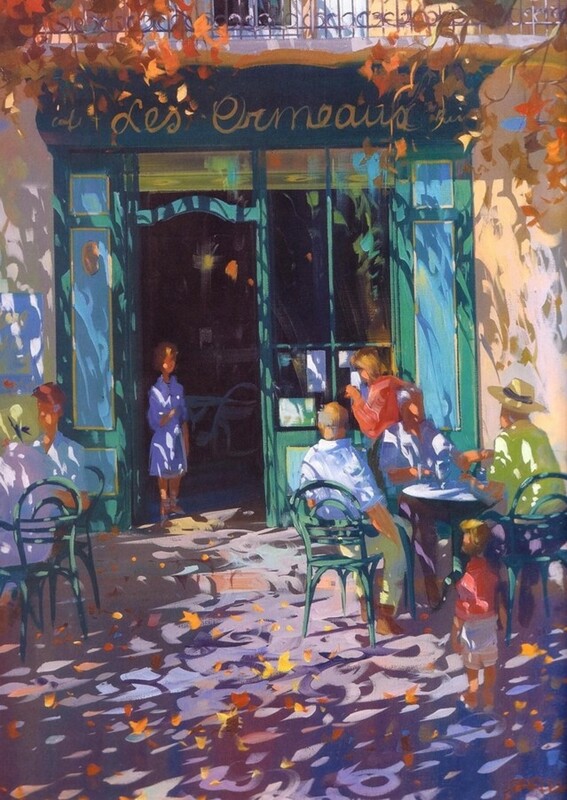 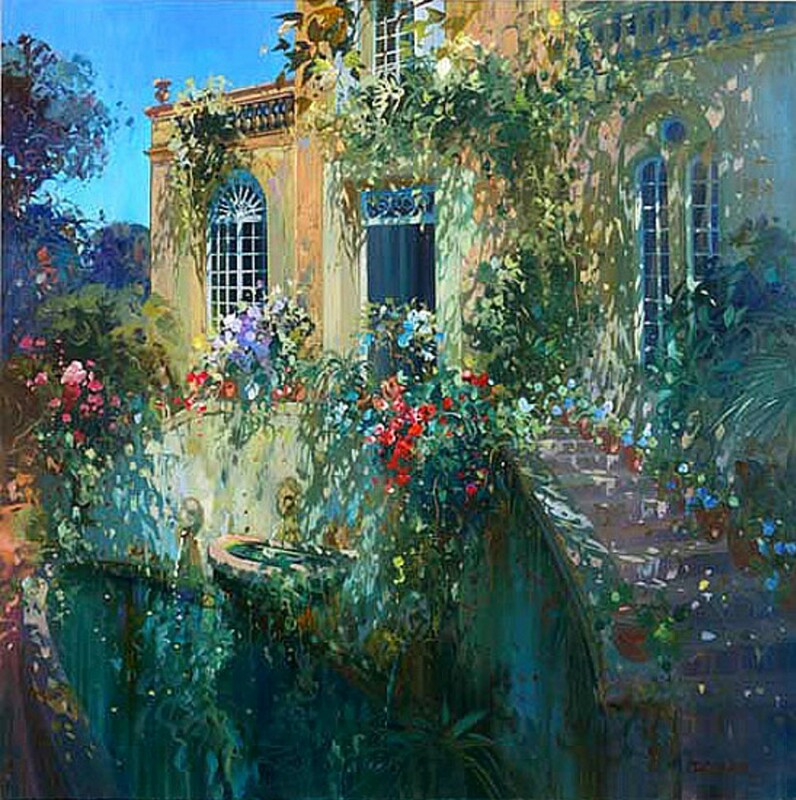 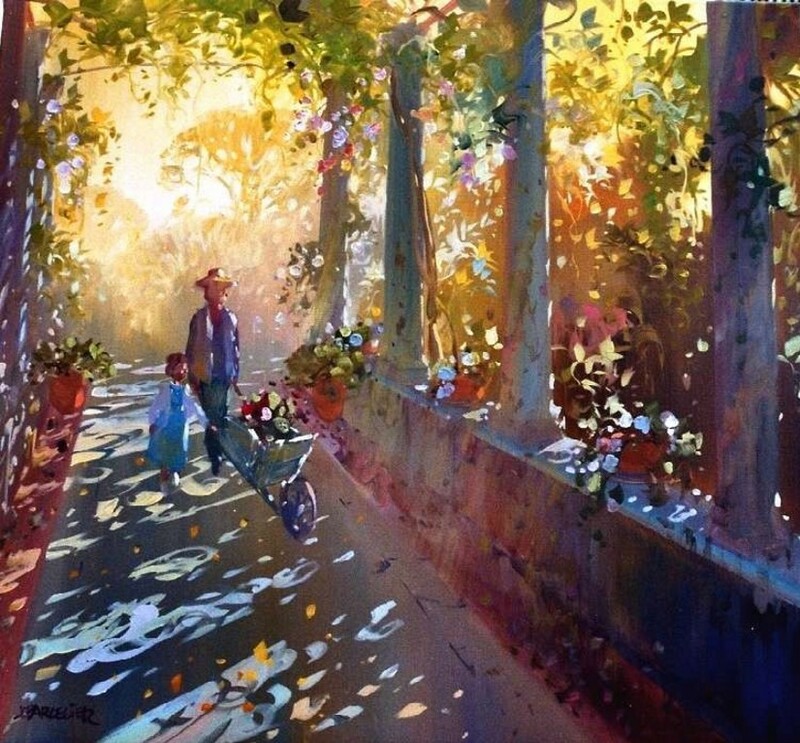 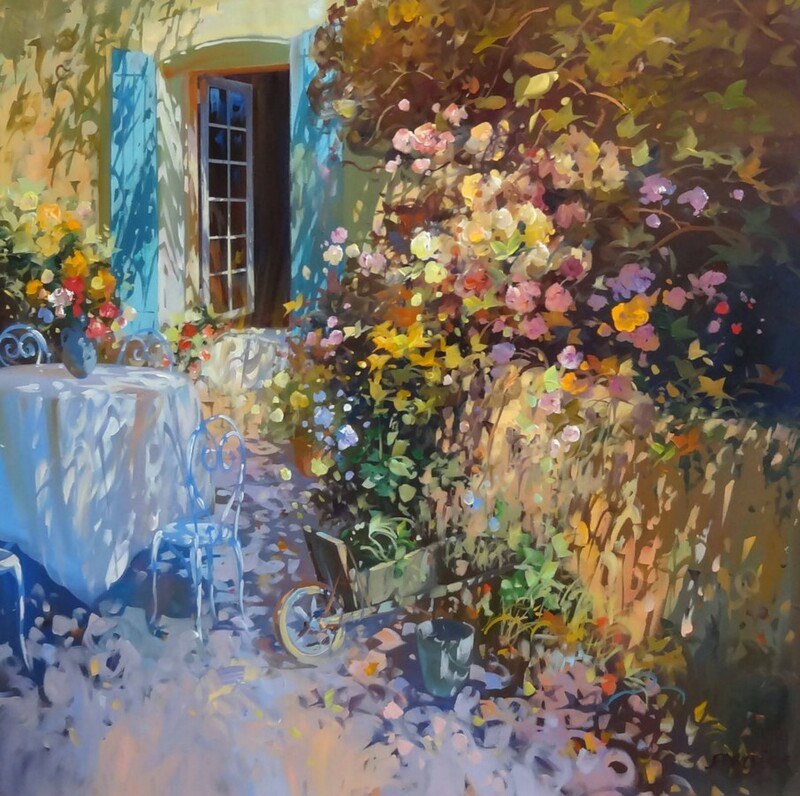 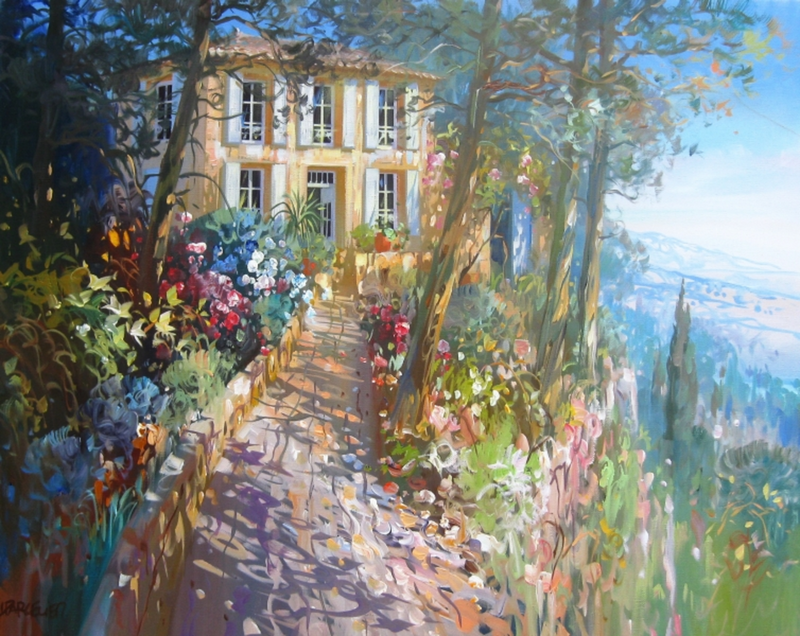 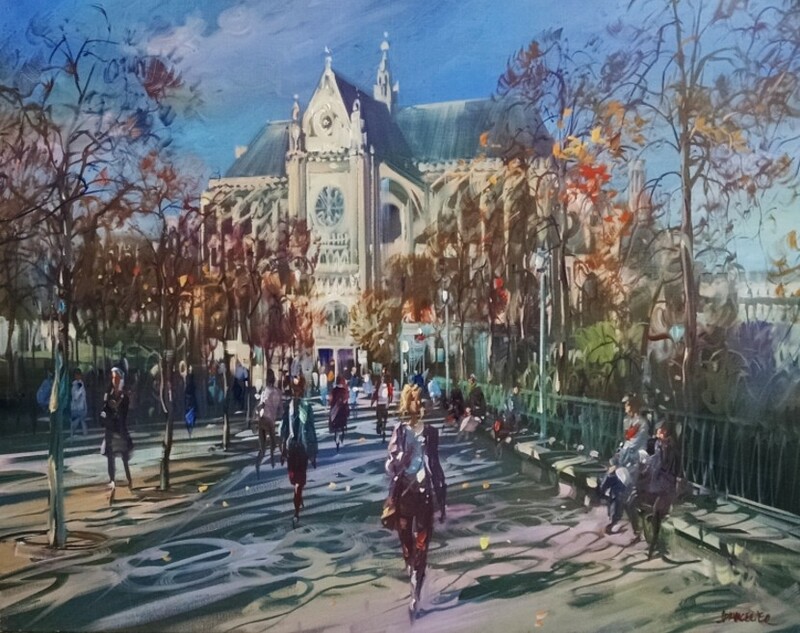 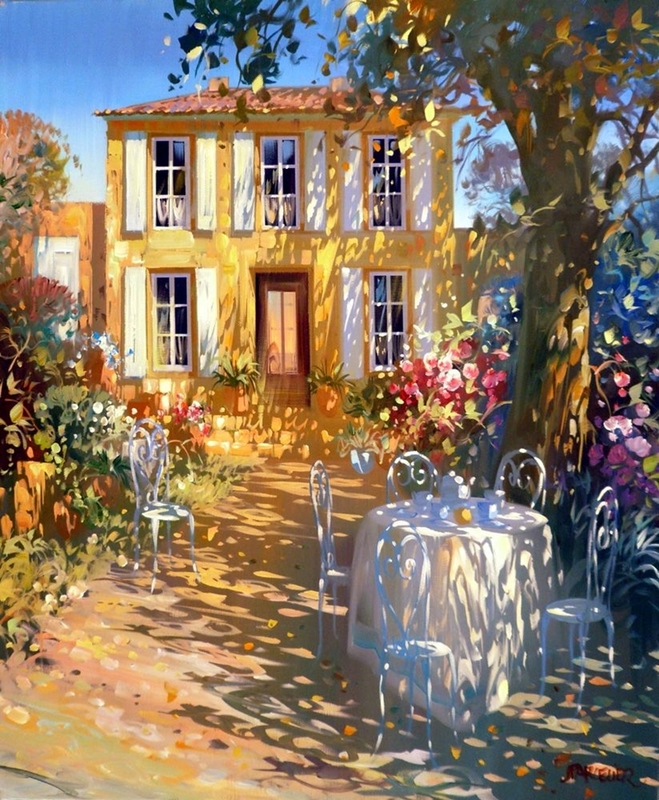 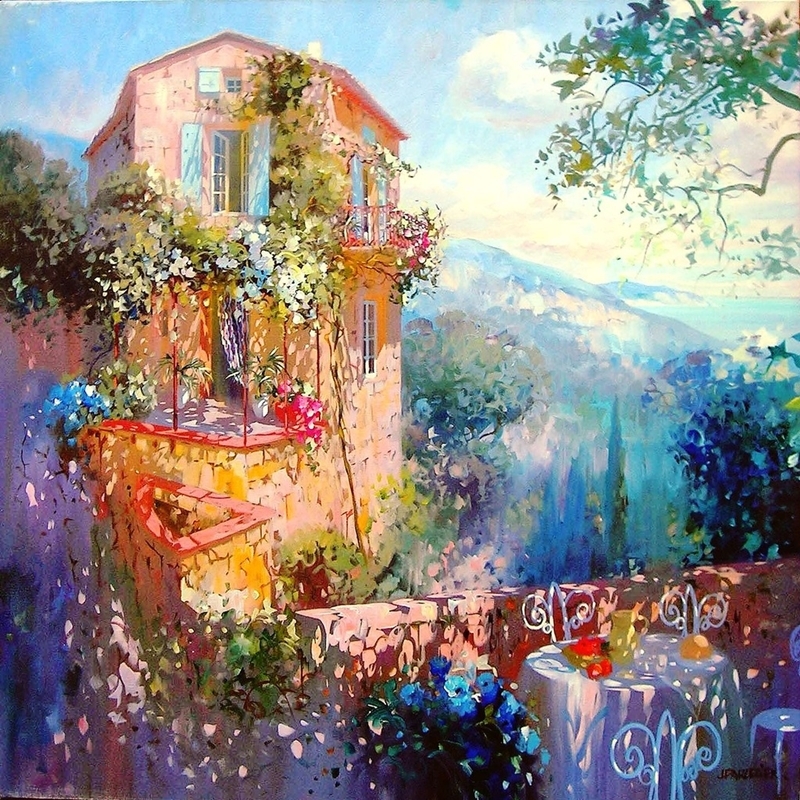 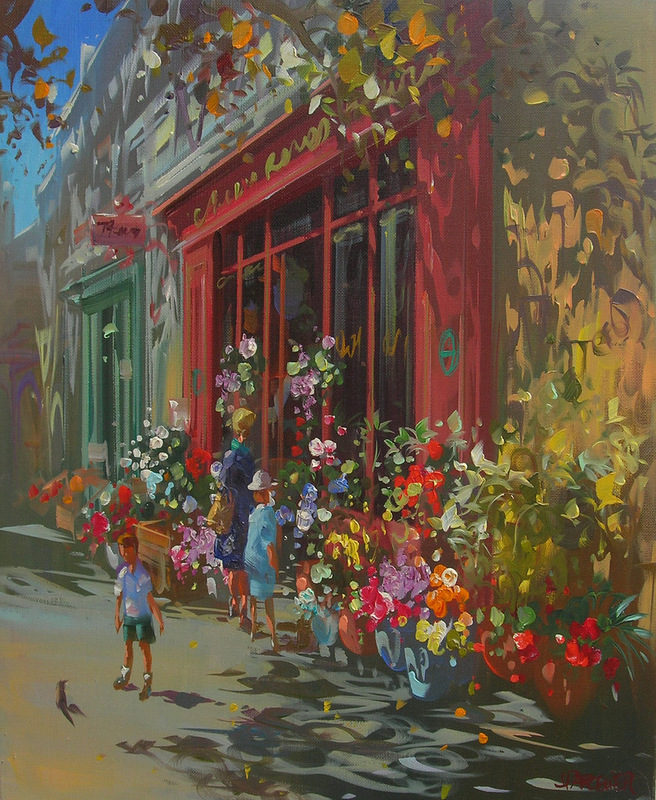 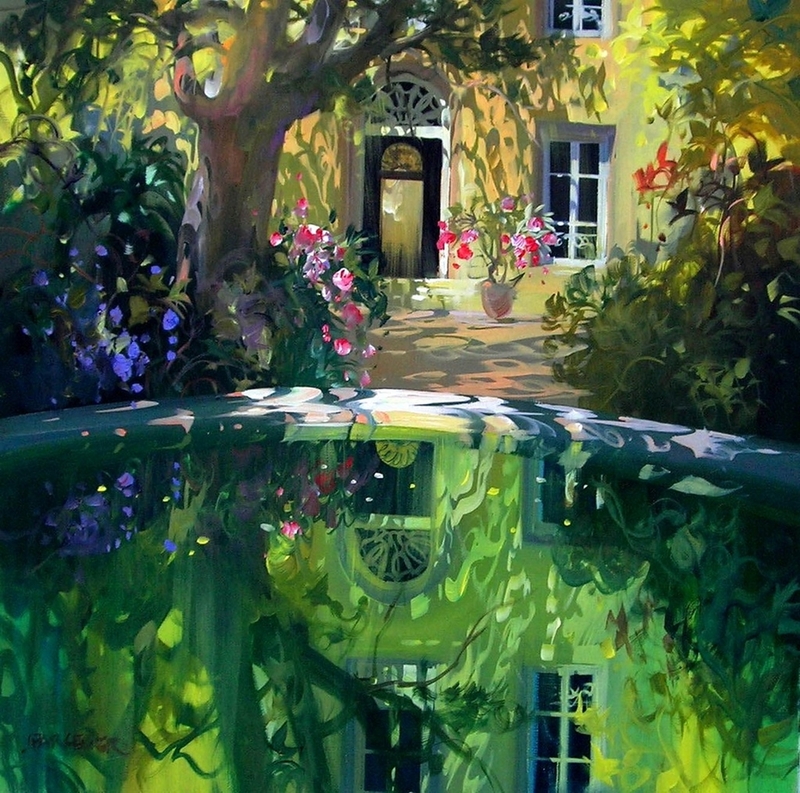 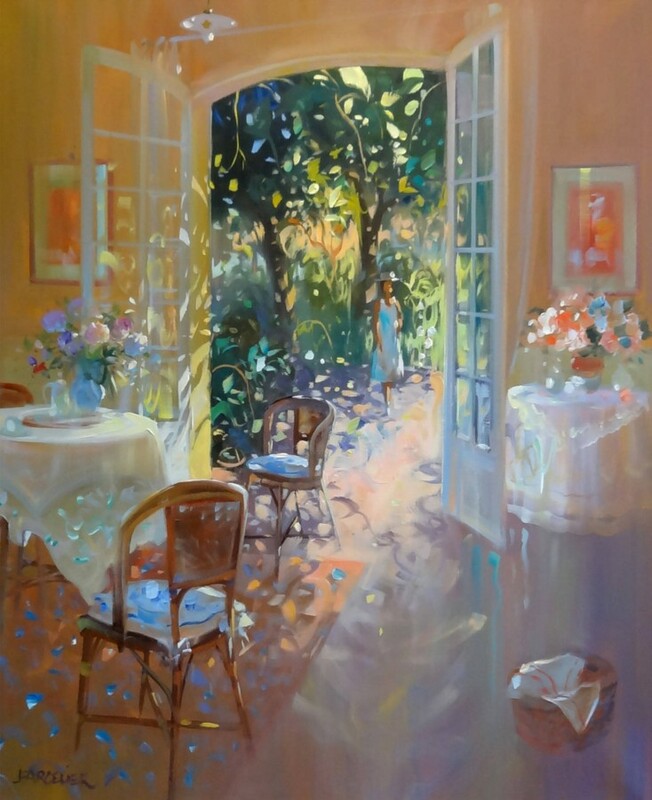 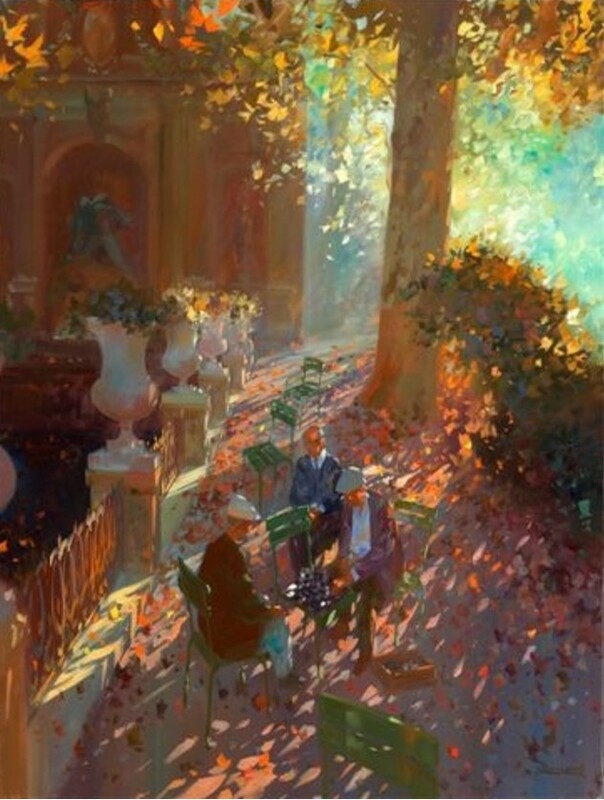 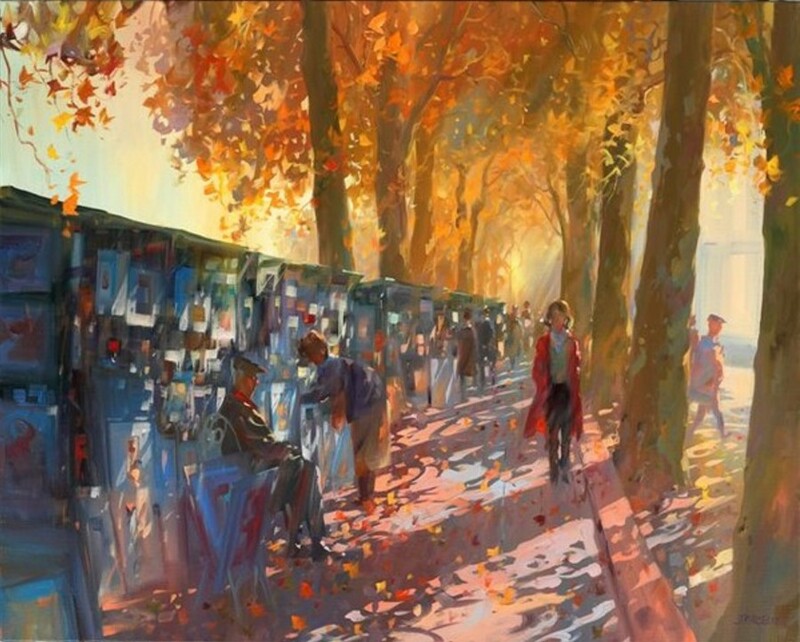 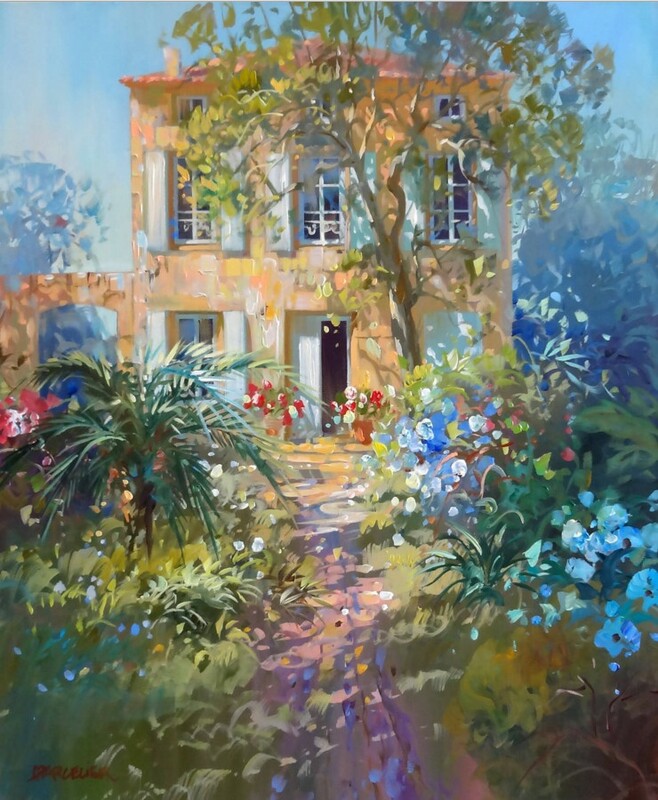 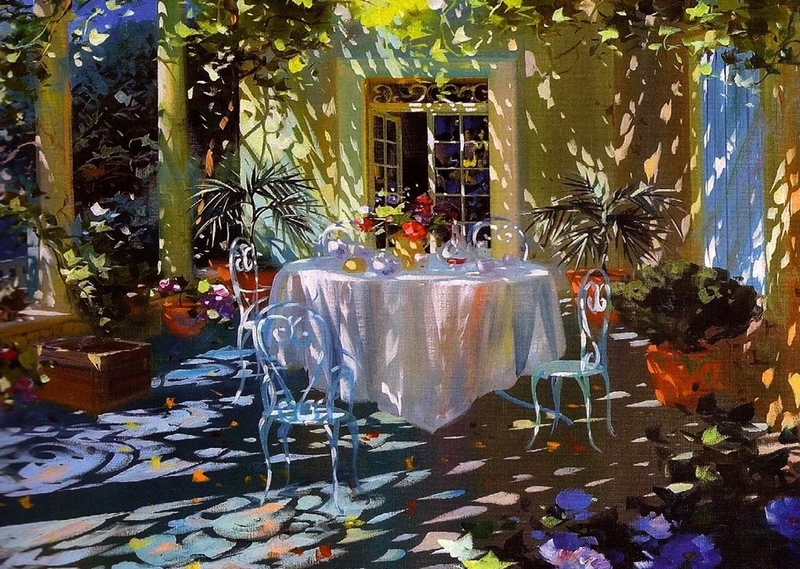 Parcelier states “I like my painting to look real, so that people can recognize the place”. 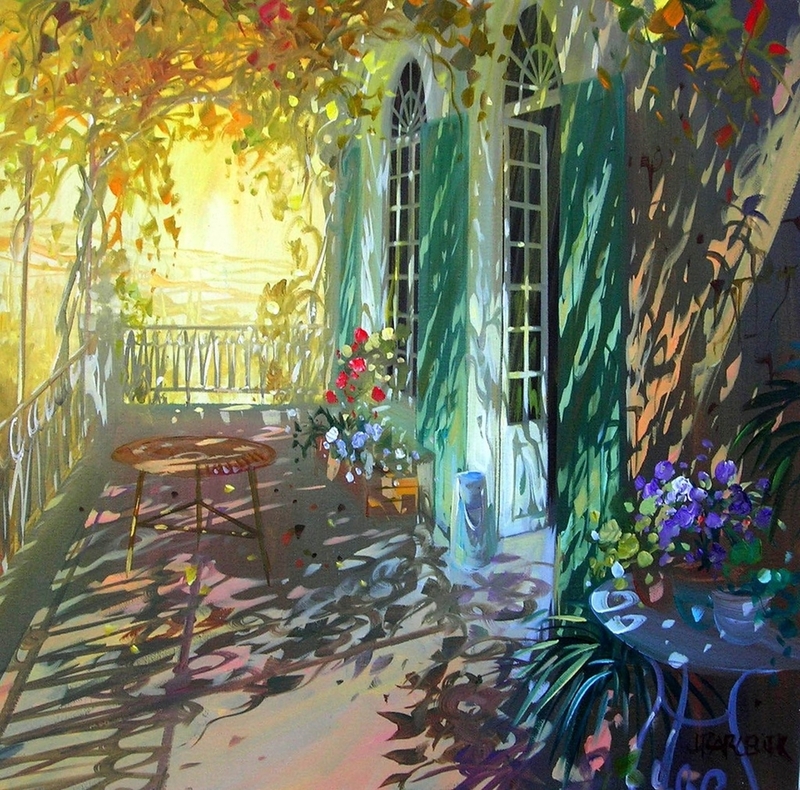 However, while preserving the atmosphere, he prefers imaginative angles in order to allow a dream to emerge from the complex alchemy of tones. 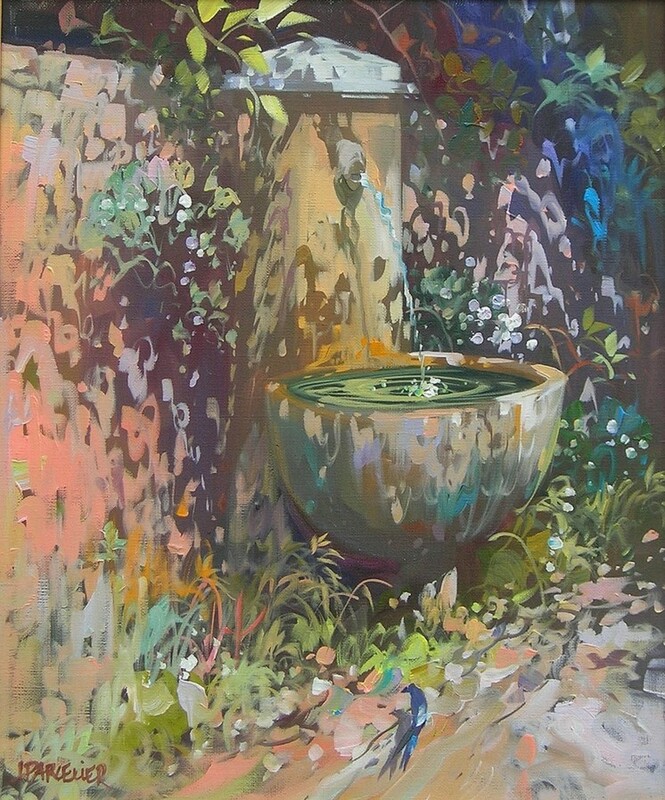 This perfectly mastered alchemy allows him to play a multicolor score in perfect harmony with the variations of the day so dear to the artist – often late afternoons rendered by a combination of purple blues and coppery brown, speckled with a few bright sparkles. 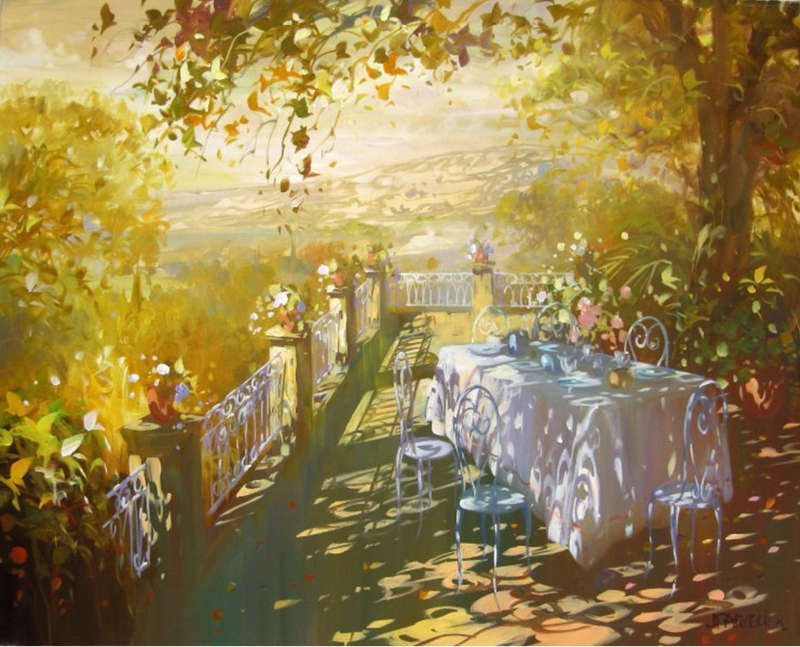 He is definitely a poet of the light. 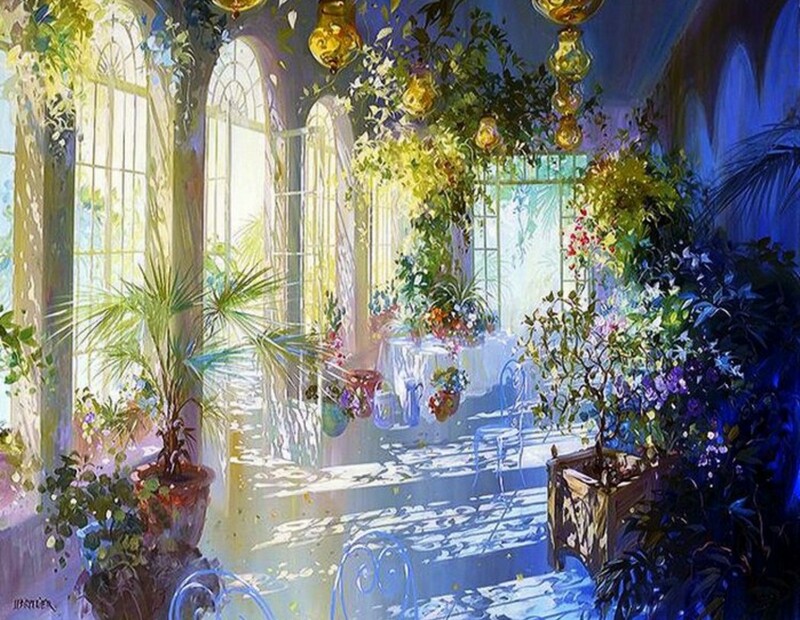 If you stand long enough in front of his paintings with eyes half-closed, you will see sparkles of light everywhere. 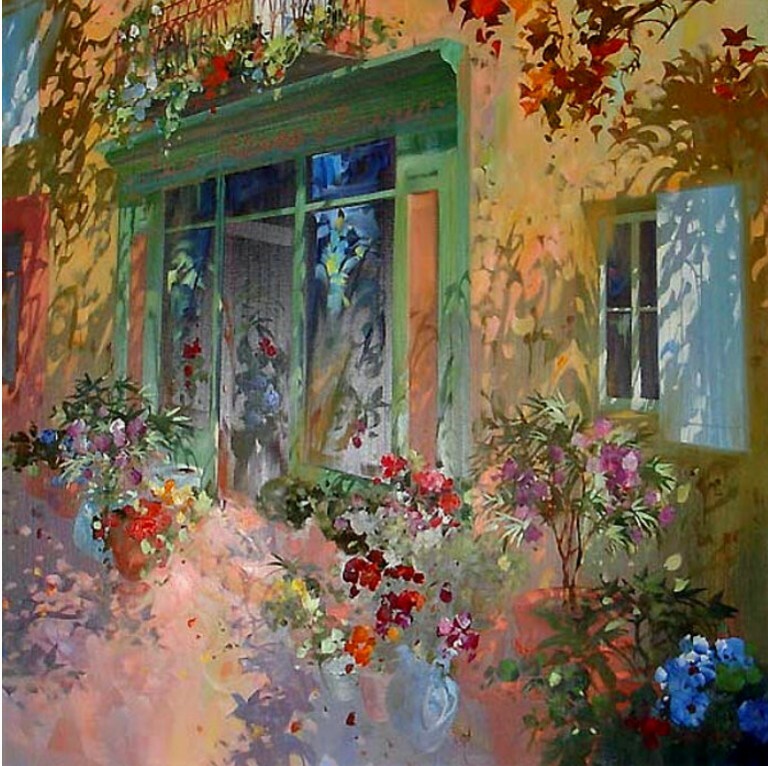 Parcelier’s paintings patiently woven in petit point, have a serene, soothing beauty, refreshing for the eye as well as for the heart, in total contrast to our hectic, bustling lives. 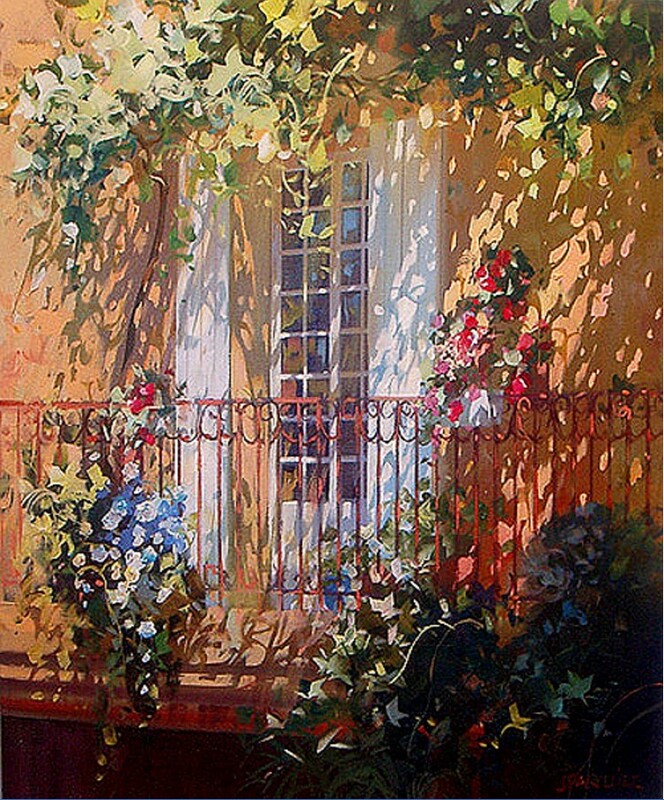 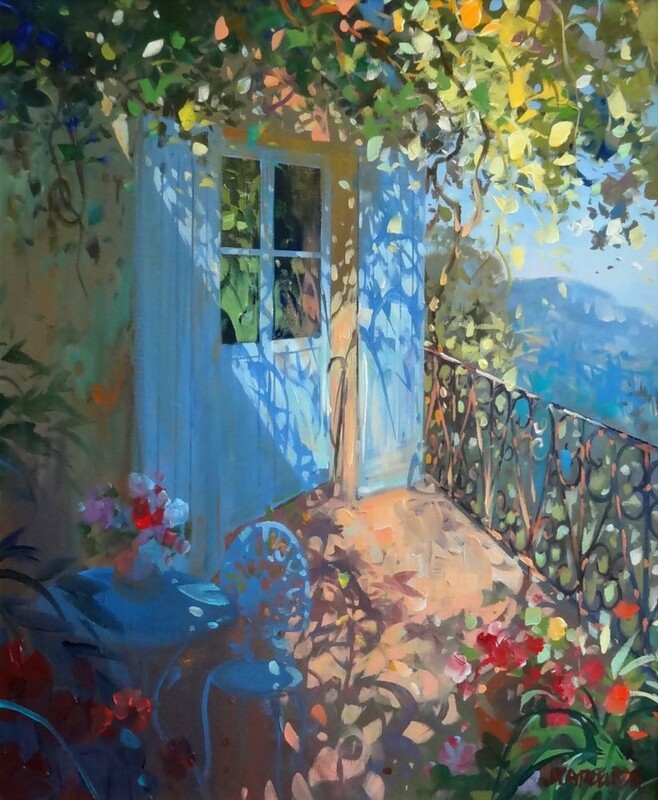 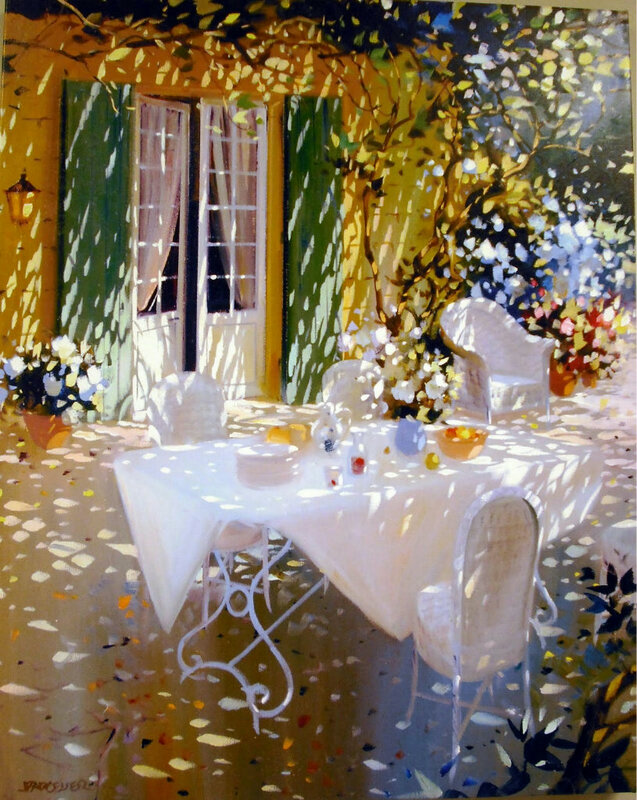 Whether he paints a home, in Paris, in Venice, or elsewhere, his paintings are an outpour of luscious vegetation bathing in radiant light. 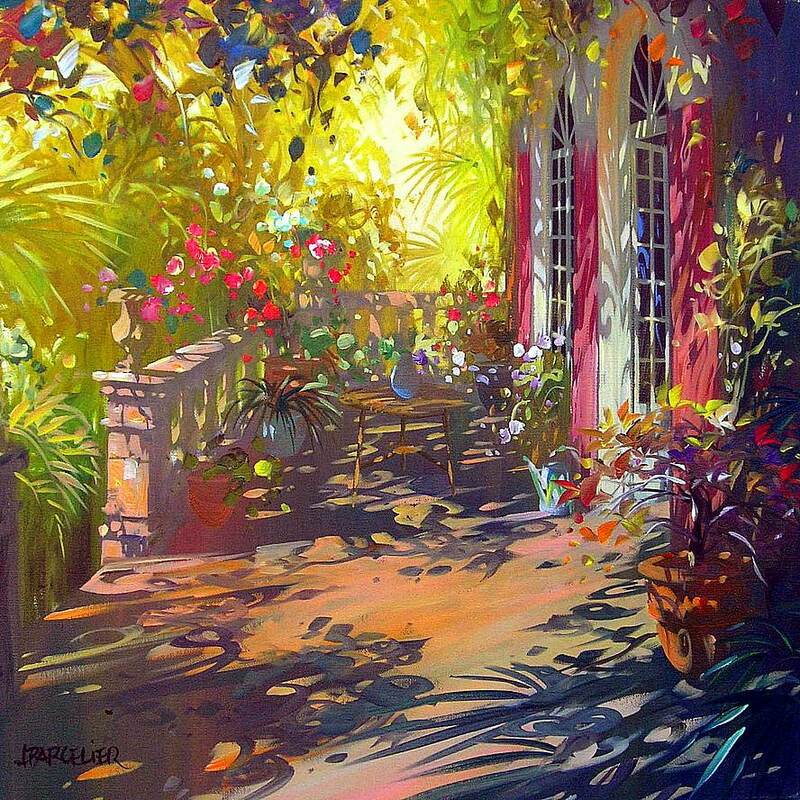 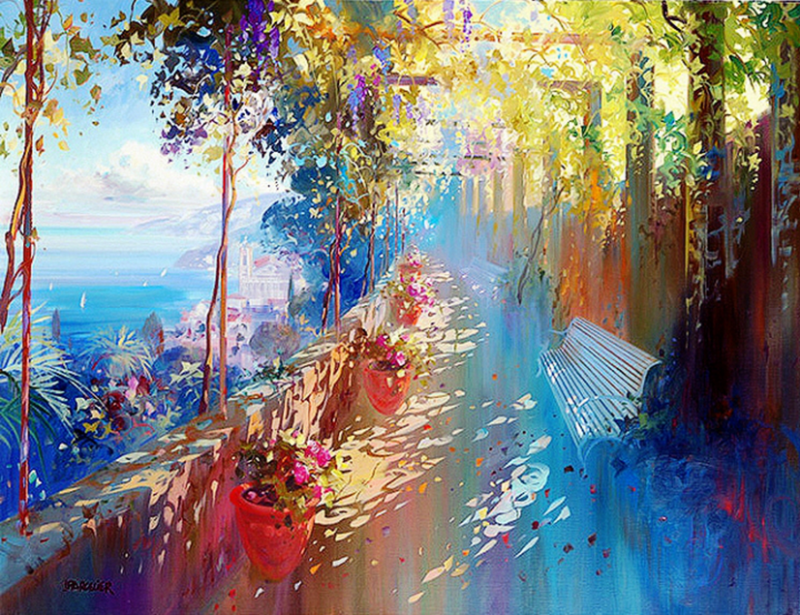 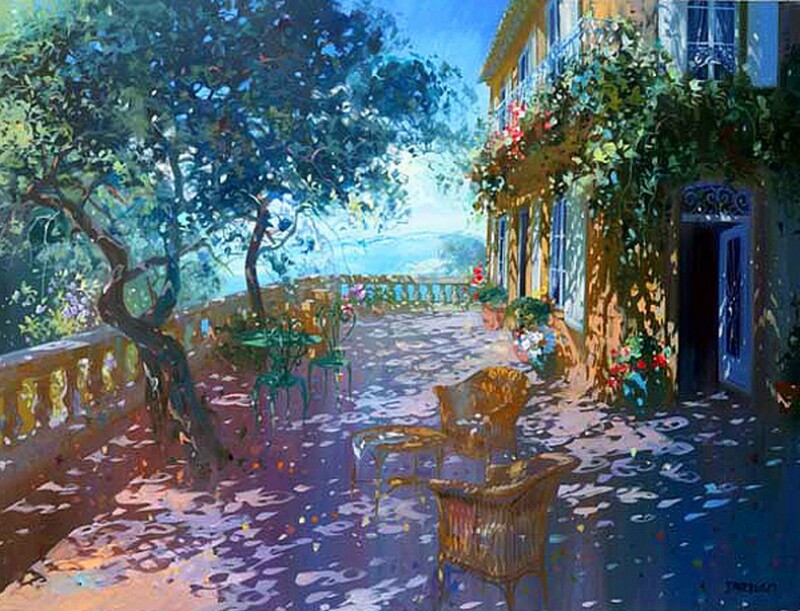 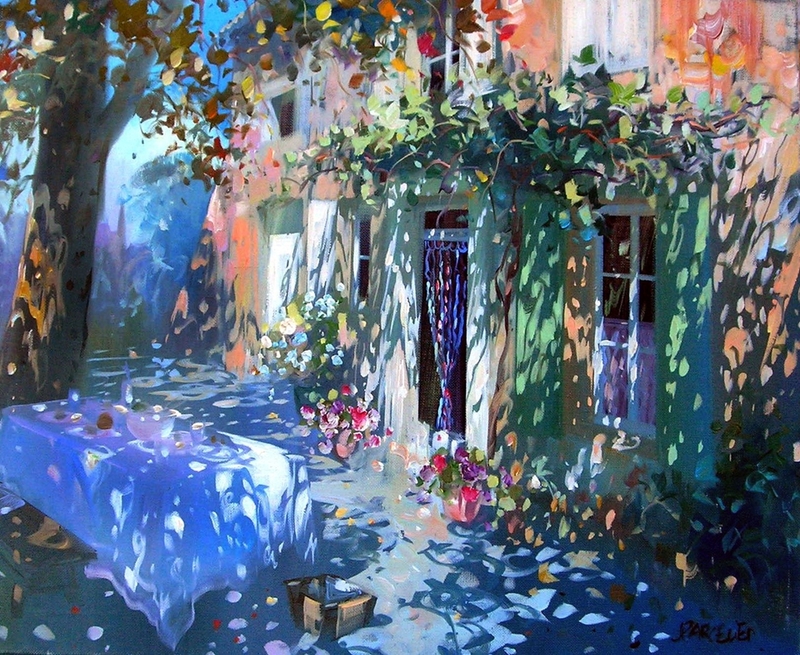 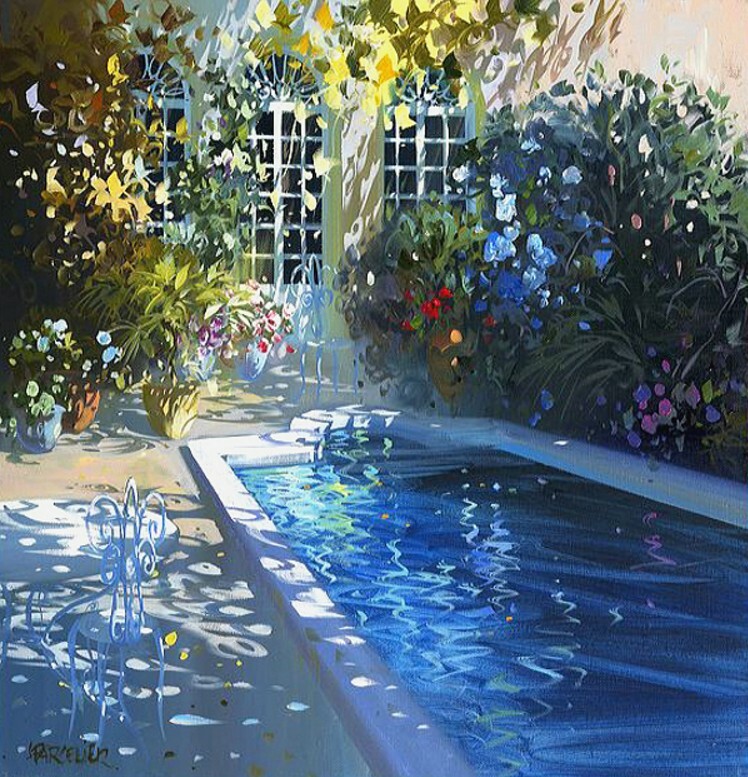 Continuously glistening, Parcelier’s paintings are simultaneously filled with light and haze. 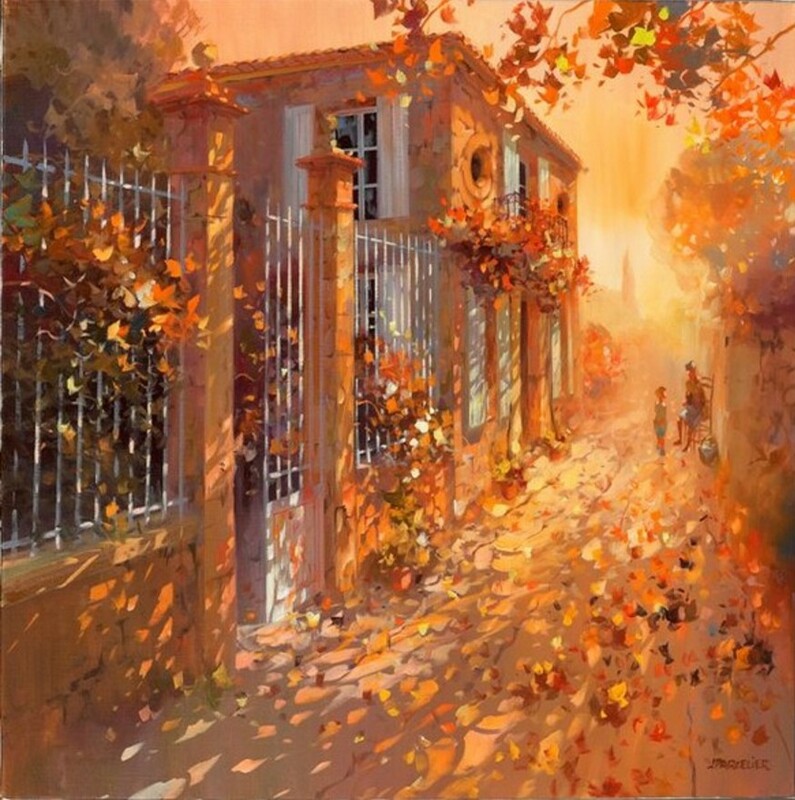 Whatever the season, the day or the time, paintings that his hands create, distill a strong heady fragrance of bliss in a symphony of light gold.